"René Tavares translates lines, dashes, blots, a personal synthesis of his own identity always in process (“unfinished”) set in constant movement in between past and present references". The last exhibition at Galeria Bozart (Lisbon). Mestre Paulo Kapela takes an exceptional position with his life and work within the artworld of Luanda, Angola's booming capital. 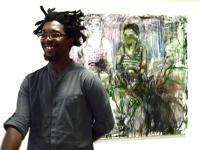 The artist is a fugitive in his own country, a Mukongo from Uige and came to Luanda in 1996. Today he is a kind of artistic and spiritual master for the younger artist generation, even if he barely speaks Portuguese, but French. He became a role model with his unorthodox way of living and his personal universe, but also with his unique way of art-production through a combination of disparate objects and the creation of new contexts.